Just as we are eager for the new fashion season, you may also be looking at your living space with a similar desire for something new. Spring is a great time to consider freshening up your home. Interior designers from At Home and Co., JJ Designs and Design Innovations share their best trends and tips for updating your home this season. The quickest way to freshen up your space is through the use of color. 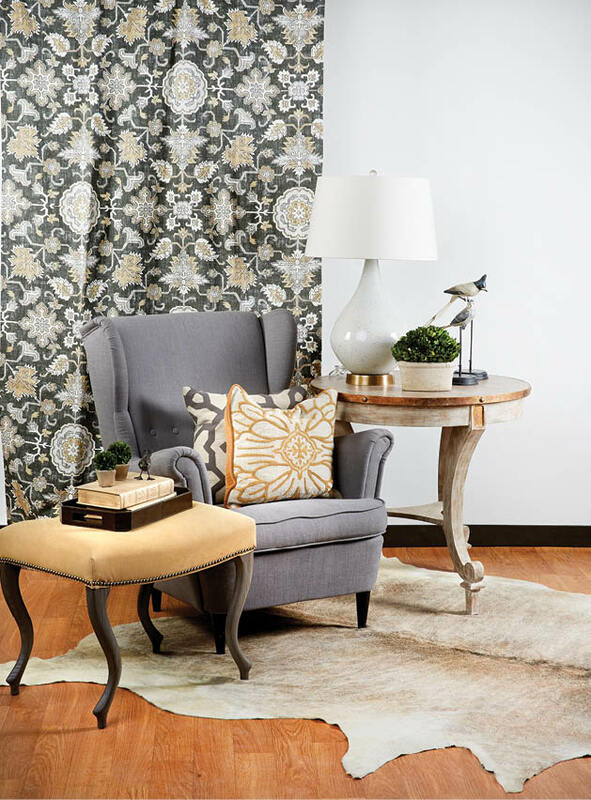 Taryn Nerison, who works with interior designer and store manager Tim Ricker of At Home and Co., and designer Jeanne Anselmo of JJ Designs agree that the trend in the home palette remains neutral, organic, and clean, but pops of color will help your space come alive. “We like to keep things fresh and light, with a punch of what we call happy colors—the colors that make you smile, like hot pink, citron greens, a rich bright blue or purple. A bold accent like a side table or a glazed lamp works great,” Nerison says. The designers agree that mixing metals is in, and incorporating gold is encouraged, even if you have bronze or stainless fixtures in your home. 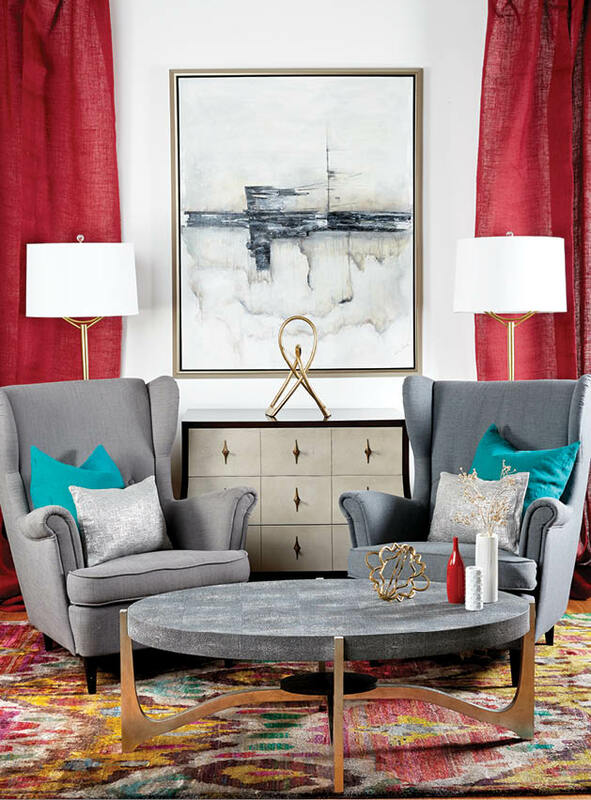 “I love all the new gold finishes for accessories and accent tables,” Hoene says. Sometimes updates are not always about changing colors. A room can be all one color, which this season happens to be about neutrals, but you may want to vary the textures in your space. Variety in textures adds depth and uniqueness to your design pieces. Anselmo suggests adding a fabulous furry pillow or hide pillow, a great throw blanket or a fun nubby area rug to create varying texture in a room. “You could also add a wood-paneled wall or textured wallpaper like grass cloth to maintain the organic and clean look,” she says. If you’re considering changing up your accessories, or reworking a mantel or bookshelf, Anselmo recommends starting with what’s personal and meaningful. “When I go to someone’s house and they say ‘I don’t have a lot of money to spend,’ I say, ‘Put all the things that you want to use on the dining room table.’ Many have a personal story or are important for some reason, where I wouldn’t know that by just looking at it,” she says. Anselmo feels accessories can give a space personality and warmth if you are involved, and do what speaks to you rather than having your space look like a designer showroom. Use fewer accessories, but incorporate those that have the most impact. It’s about cleaner lines, with fewer, bigger accessories; grander versus lots of pieces. “It could be a really beautiful lamp or a huge vase, a cool handcrafted bowl or a sculpture,” Anselmo says. For the mantel, Nerison suggests focusing on varying height or width. She recommends smaller pieces on the side with some large artwork. “That’s typically where we put commissioned art or some nicely done photos in black and white. It adds that personal touch to a space,” she says. Before you run out to the store, try working with your current accessories. Take everything down, dust it and clean it, and then ask yourself, do I love this? “And maybe try to put it back somewhere different. It will make it feel new,” Anselmo says. If you are on the lookout for new different accessories, lamps can have a big impact. “Crystal lamps are really stunning,” says Nerison. If you do choose a new lamp, make sure it works with the size of the room and the scale of the furnishings around it. Throw new pillows in a bold print on something. “You don’t have to spend a lot of money, but it makes a statement almost like artwork,” Anselmo says. If you need a pattern suggestion, Hoene recommends a new take on the chevron horizontal pattern. “It is now larger and more of a V-shape, with contrasting tones and textures,” she says. Hoene also recommends trying out accessories in a new accent color throughout the main level of your home. “When guests see the accent throughout the main level, it makes your home feel more cohesive. If you’re feeling bold, perhaps paint an accent wall of your new color in one of the main level rooms,” she says. Rustic farm tables are still big, but they’re more elegant and modern. Driftwood tables are also becoming more popular. These items are great for families with children, because the more scratches, the better. If you’re looking for new artwork, Anselmo suggests picking art that really speaks to you. “I think artwork is coolest and resonates the most when it’s not artwork bought to just match things or what is on trend,” Anselmo says. You might have a really modern space, but you have a piece of artwork that is a family heirloom, or you love a piece that’s almost modern but you have Louis XIV chairs next to it; don’t worry. Be confident—don’t be controlled by the market. You can look to trends to guide you, but at the end of the day, design is about what you like. If you’re looking to be a trendsetter, consider hiring a professional. Hoene says to avoid the ordinary and safe. “If you have seen it in every store and everyone else’s home for years now, try something that is new and exciting to your eye”—which is where a professional can help. “It’s always nice to bring someone in who has an outside opinion and not decorate by committee,” Nerison adds. Ultimately, it’s only stuff, so have fun playing around with your design. And hiring a designer doesn’t always have to be an expensive endeavor; you can always call upon a professional for consulting. Tim Ricker // Interior designer & store manager At Home & Co.